"it is Morris... who can properly be called the first English Marxist" - A. L. Morton, Political Writings of William Morris. Following is a very brief biography of William Morris, for more information see the comprehensive chronology of William Morris' life. See also Terry Liddle's The heritage of William Morris, Ian Birchall's Morris, Bax and Babeuf and E. P. Thompson's William Morris. 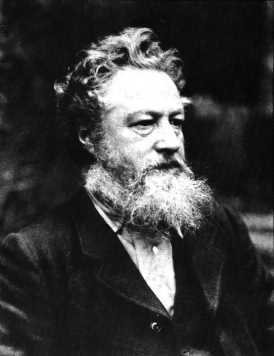 E. P. Thompson's biography of William Morris, William Morris: Romantic to Revolutionary is the definitive work on Morris and is available from Merlin Press. William Morris was born on 24th March, 1834, in Walthamstow, then a suburban village on the edge of Epping Forest. His first contact with the working class and first political activity came through his involvement in the struggle to stop Disraeli's Tory government going to war with Russia between 1876 and 1878. It is true that much of his work still lives, and will live. But we have lost him, and, great as was his work, he himself was greater ... he was better than the best. Though his words fell like sword strokes, one always felt that the warrior was stronger than the sword. For Morris was not only a genius, he was a man. Strike at him where you would, he rang true ... he was our best man. We cannot spare him; we cannot replace him. In all England there lives no braver, kinder, honester, cleverer, heartier man than William Morris. He is dead, and we cannot help feeling for a while that nothing else matters." Thanks to Tony Benn MP, for providing this quote.